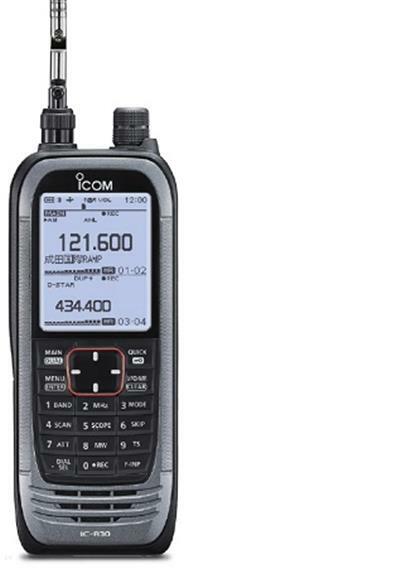 The IC-R30 is Icom's latest wideband handheld receiver. Not only does it receive over a wide (0.1 to 3304.999 MHz) frequency range in AM, FM, WFM, USB, LSB and CW, but it can also decode digital modes including P25, NXDN, dPMR, D-STAR and Japanese domestic DCR. The IC-R30 covers a wide frequency range from 0.1 to 3304.999 MHz in AM, FM, WFM, USB, LSB and CW as well as digital modes*. A ferrite bar antenna for AM broadcasts is built-in, and the earphone cable can be used as an external antenna for FM broadcasts. *SSB, CW and digital modes: 0.1 MHz–1.3 GHz. Usable frequencies and modes differ, depending on the selected A or B band. See specifications for details. The IC-R30 decodes various digital modes, including P25 (Phase 1), NXDN, dPMR, D-STAR (Digital Smart Technology for Amateur Radio) and Japanese domestic DCR (Digital Convenience Radio). * A microSD/microSD HC card is required. A 2.3-inch large, dot-matrix display is used in the IC-R30. Screens with large amounts of information are clearly and logically arranged. The four-direction keypad provides straight-forward operation of all functions. The integrated GPS receiver displays your current position data, course, speed and altitude on display. GPS data can also be saved in recorded audio files. The IC-R30 can list up to 50 stations within 160 km; 99.4 miles from your current location*. * The position data of each station must be pre-programmed in the Memory channels. • Near station scan: Using GPS location information and the Memory channels*, the IC-R30 can display and scan up to 50 stations within 160 km; 99.4 miles from your current location, in proximity order. • Auto memory write scan: Automatically stores received frequencies (up to 200 Ch) during a programmed scan. • Priority Scan: Checks for signals on a frequency every 5 seconds, while operating on a VFO frequency or scanning. • Tone scan: Detects a sub-audible tone frequency or the DTCS code in a received signal. • Program scan, Memory scan, Memory mode scan, Group scan, Group link scan and more. The band scope function enables you to visually search a specified frequency range around the received signal and see the relative received signal strength level. You can jump to the desired signal on the band scope to set the radio to that frequency. The Speech function reads out the operating frequency and mode when you rotate the dial knob or press the [SPEECH] button. This function is convenient for making radio adjustments with the Bluetooth headset without having to look at the radio. The IC-R30 has IP57 waterproof protection (1 m depth of water for 30 minutes). It can be used in harsh outdoor environments. The radio also meets MIL-STD-810-G specifications. The supplied BP-287 Li-ion battery pack provides up to 8 hours and 20 minutes* of operation. The optional BP-293 battery case, with AA (LR6) alkaline cells, can be used as a convenient backup battery. The built-in USB port has a range of convenient uses. You can charge the IC-R30 in approximately 5 hours*, carry out data transfer (including loading Memory channels) and CI-V remote control. You can use a microSD card* for data storage. Recording/playback of received audio, RX history log, radio settings and GPS logger data can all be loaded onto the microSD card. With the optional VS-3 Bluetooth® headset, you can wirelessly listen to the received audio. The VS-3 has volume UP/DOWN buttons and four programmable buttons to remotely control certain functions. OS: Microsoft Windows10, Windows8.1 (* Except for Windows RT) or Windows7.